Religious Education is taught in a self-contained suite of 4 classrooms, one being a sixth form seminar room. Each classroom has an interactive whiteboard and the classroom doors are ‘themed’ for different religions. 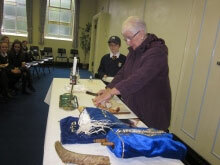 Religious Education follows the Cheshire Agreed Syllabus and pupils ‘Encounter’ and ‘Respond’ to religion. In Year 7 students are introduced briefly to all the religions that they will study at Christleton and then they investigate in depth the History of Judaism and Judaism today, followed by the religion of Islam. In Year 8 they follow up on their visit to the gurdwara by learning about Sikhism, following which they focus on the life of Jesus. Year 9 students start with Hinduism and then investigate the existence of God, sexism, racism and beliefs and teachings across different religions. 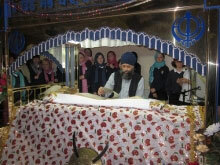 In KS3 students enjoy trips to a variety of places of worship including a synagogue, gurdwara, mosque. All students in KS4 study Core Religious Education, focusing on social and moral issues from the viewpoint of Christianity and Islam, as well as a topic on Buddhism and atheism and science. Religious Studies is a popular option at GCSE. Typically there are 3 option groups at GCSE in each year group. The new GCSE course will be the AQA Specification A, with Christianity and Islam studied in Component 1 and Religious and Ethical studies covered in Component 2.